Carrots are a versatile vegetable, rich in beneficial nutrients such as beta carotene. Carrots often end up in soups, stews and salads, or they are eaten as a snack. You can cook carrots in a variety of ways, including boiling, steaming, roasting or microwaving. 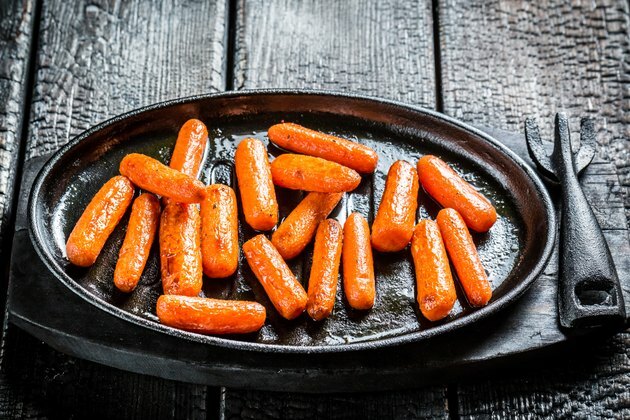 Grilling carrots in foil is one way to add the smoky flavor of the barbecue, and it enables you to add extra flavors inside the foil as the carrots grill. Place a square piece of aluminum foil on a flat surface and spray it with a nonstick cooking spray. Brush with oil if you don't have spray. Cut four or five carrots into ½-inch slices and place them all in the center of the foil. Add any extra ingredients you want on top of the carrots. These may include butter, lemon juice, brown sugar, onion, garlic or fresh herbs. Fold the foil lengthwise so the two ends are even. Roll it down tightly over itself until you reach the carrots. Fold the two ends and roll them tightly in toward the center. Inspect the package to ensure there aren't any openings. Add the foil package to the grill, directly over the heat source. Leave it on the grill to cook for 10 to 15 minutes, or until the carrots are tender crisp. Open the foil and check the carrots about three-quarters of the way through cooking time to ensure they don’t overcook. You can use baby carrots for the recipe as an alternative.